A study led by LMU researchers throws new light on the evolution of the so-called rock sponges, and reveals that conventional, morphology-based taxonomies do not accurately reflect the true genealogical relationships within the group. Modern approaches to biological systematics have demonstrated that the evolutionary relationships between organisms can best be teased out by combining morphological analysis of fossil material with molecular genetic investigation of the genomes of living species. “This is a challenging task, particularly when fossil evidence is sparse, as in the case of most families of sponges,” says Professor Gert Wörheide of the Geobio-CenterLMU and LMU’s Department of Earth and Environmental Sciences. “The so-called rock sponges represent an exception to this rule insofar as they provide among the richest fossil record of sponges. With the aid of these fossils and the most comprehensive analysis yet carried out of gene sequences from extant species, an international team led by Wörheide has now reassessed the genealogy of the rock sponges – and show that, in many cases, traditional taxonomy does not correctly depict the evolutionary history of the group as a whole. 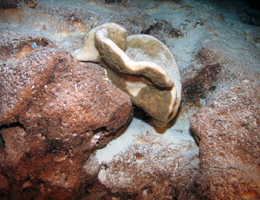 Rock sponges belong to the class Demospongiae, which account for the great majority of contemporary species assigned to the phylum Porifera. Demosponges are found in tropical, subtropical and temperate regions of the world’s oceans and occur at all depths from shallow reefs to abyssal depths. More than 300 extant species of rock sponges have been recognized, and classified into 41 genera that are assigned to 13 families. However, by comparison with the range of species represented in the fossil record, with over 300 genera comprising 34 families, the degree of diversity found in the contemporary demosponge fauna is comparatively modest. “The origins of modern rock sponges can be traced back over more than 500 million years into the Paleozoic, and this suggests that much more research will be needed before we understand their evolutionary history,” Wörheide adds. Rock sponges have a highly characteristic and extremely robust rock-like skeleton, which consists of barbed needles called spicules made of silicon dioxide (i.e., glass), which interlock to form a rigid network. The form and structure of the skeletal elements provide some of the most important characters used to classify the rock sponges. “However, their precise classification and many aspects of their evolutionary history are still the subject of controversial debate,” says Astrid Schuster, a doctoral student in Wörheide’s group, who is first author of the new study. “Previous classifications were largely based on morphological similarities, and these led taxonomists to place many genera in the order 'Lithistida', a dubious grouping which is still cited frequently in the literature,” she explains. With the aid of international colleagues, the team has now extended earlier molecular systematic studies and sequenced a specific pair of genes in each of 68 individual species of rock sponge, which had previously been assigned to 21 genera and 12 families. In addition, the team made use of previously reported gene sequences that were available in public databases. The new study lays the groundwork for further investigations, in which the researchers will try to pinpoint the times at which the different sponge lineages diverged from one another. To do so, they will exploit the principle of the “molecular clock”, which reflects the fact that the extent of molecular divergence between sequences of the same (“homologous”) genes in any given pair of species provides a measure of the time elapsed since they diverged from one another. By dating divergence times, this strategy promises to enhance our understanding of sponge evolution, and should help to explain why Porifera are among the oldest groups of multicellular organisms still in existence.